Blu-ray discs are currently still high-cost gadgets for people’s daily digital entertainment. Also, just like DVD discs, Blu-ray discs are quite fragile and easy to get damaged like scratches, breakages, stains, etc. In such cases, copy Blu-ray discs lets you get a backup of Blu-ray movies, onto either computer disk or blank Blu-ray disc. You no longer need to worry about damaging your precious Blu-ray discs. There’re various ways for you to copy and backup Blu-ray discs. If you’re looking for a way or a 1-click Blu-ray copy software app that could copy Blu-ray discs in 1:1, no quality loss and disc compression neither, this place is where you should stop to focus and read on. As the name of “1:1 disc to disc Blu-ray copy” suggests, it means that during disc to disc Blu-ray copy process, there’s no disc compression and quality loss. All things, including surrounding sound, multilingual, chapter points and menu navigation, in original Blu-ray supplements are fully copied to the new target blank Blu-ray disc. In short, all content in Blu-ray disc A is copied, transferred and then stored in a blank writable Blu-ray disc B.
It’s quite easy to learn that to realize 1:1 Blu-ray copy, several things are needed: original Blu-ray movie disc, target blank writable Blu-ray disc, a computer with Blu-ray drive recorder, and 1click Blu-ray copy software to copy Blu-ray discs on computer. If possible, 2 Blu-ray drives connected to the same computer would greatly save time as direct disc-to-disc Blu-ray backup is feasible. If only 1 Blu-ray drive is connected to computer, the disc to disc copy process could be a little bit complicated as it would go in disc-ISO-disc style, which means the Blu-ray disc needs firstly to be copied into a Blu-ray ISO image file (an ISO image file is a complete copy of an optical disc, including everything original optical disc gets), and then the generated Blu-ray ISO image file is burned to target blank Blu-ray disc to finish 1:1 Blu-ray copy process. 1. Which Blu-ray discs (BD50 or BD25) could be used as target Blu-ray disc? It depends on the original Blu-ray disc. For example: your original Blu-ray disc is BD50 disc, the target Blu-ray disc should be BD50 disc. A BD25 disc would not be sufficient in storage, which surely results in disc compression. BD25 for BD25 originals while BD50 for both BD25 and BD50 originals. 2. What is the difference between BD-R and BD-RE discs? With BD-R (short for BD recordable) disc, you can burn files to a disc once (in one session), but you can’t delete files from the disc. Each burn is permanent. While with BD-RE (short for BD re-recordable) disc, you could burn files to a BD-RE more than once (multi session support). It can be burned and erased many times. The speed of copying a Blu-ray disc depends on several things: source Blu-ray disc content, Blu-ray reading speed, computer performance, Blu-ray copy software performance, etc. Graphics card acceleration could be made use of for speeding up Blu-ray backup. The Blu-ray Disc format employs several layers of digital rights management (DRM) which restrict the usage of the discs, including: HDCP (High-bandwidth Digital Content Protection), BD+ and BD-ROM Mark. Thus, if you want to copy Blu-ray discs with protections, you need firstly remove the Blu-ray disc protection. A Blu-ray copy software app that comes with Blu-ray disc decrypting is a must-have. Since some Blu-ray discs are encrypted, it’s necessary to connect to the Internet for Blu-ray disc decrypting before copying a Blu-ray disc. Neither the creator of this guide, nor any makers of the included software, will be held responsible in any way for the use or misuse of this material. This tutorial was created for those who want to protect their Blu-Ray investments, but need help with the technical knowledge on how to perform the backup process, as it is somewhat complicated. As previously stated, this guide is only to be used by those who own the Blu-Ray discs that they are backing up. You are prohibited from using this tutorial on discs obtained through rental or subscription services. Any use of this guide for all legal and/or illegal purposes is the sole responsibility of the end user. This guide comes with no expressed or implied warranty or guarantee/support of any kind. As mentioned above, to make 1:1 Blu-ray copy, Blu-ray backup software is a must-have. It would be better that the Blu-ray backup software decrypts Blu-ray discs as there might be encrypted Blu-ray discs to backup. Check the below guide to learn how to copy Blu-ray discs and backup Blu-ray in 1:1 quality. 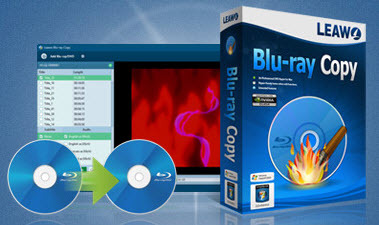 Leawo Blu-ray Copy is a 1click Blu-ray copy and backup software program that multiple advantages on backup Blu-ray discs, folders, and/or ISO image file without quality loss. It’s a Blu-ray backup software app, Blu-ray player app, Blu-ray disc decrypter, and Blu-ray compressor. Blu-ray disc decrypting technology could decrypt the latest released Blu-ray discs with BD+ and the latest MKB protection. Fast Blu-ray copy with support of 3 different graphics card acceleration: NVIDIA CUDA, AMD APP and Intel Quick Sync. Insert original Blu-ray disc into the Blu-ray drive and then launch Leawo Blu-ray Copy on computer. Click the “Add Blu-ray/DVD” button to browse and add original Blu-ray disc into this 1 click Blu-ray copy software for backup Blu-ray. You could also click the inverted drop-down arrow button next to the “Add Blu-ray/DVD” button to directly select Blu-ray drive for importing. 1. Since you need to do 1:1 disc to disc Blu-ray backup, carefully select output disc type at the bottom-left corner according to your original Blu-ray disc. For example, if your original Blu-ray disc is a BD50 disc, select BD-50 as output disc type (of course, you need to prepare a blank writable BD-50 disc as target Blu-ray disc for 1:1 disc to disc Blu-ray copy). But if your original Blu-ray disc is a BD25 disc, you could then freely select BD-25 or BD-50 as output disc type according to your blank writable Blu-ray disc. 2. Select “Full Movie” mode at the bottom of the left processing list. Click the big green “Copy” button and then finish related burning settings on the popup sidebar. As you need a 1:1 disc to disc Blu-ray copy, you need to insert target blank writable Blu-ray disc into the other Blu-ray recorder drive of your computer (if your computer gets 2 Blu-ray drives) and then select the bank Blu-ray drive as target under “Copy to”. Don’t worry if you only have one Blu-ray recorder drive as you could firstly choose to create an ISO image file of original Blu-ray disc by selecting “ISO File” option under “Copy to” and then burn generated ISO Image File onto your blank Blu-ray disc with this Blu-ray backup software again. Also, set the other 2 options “Disc Label” and “Save to”. After these, click the bottom “Copy” button to start copying Blu-ray discs. After copying, the 1:1 disc to disc Blu-ray backup is finished. Insert your target blank writable Blu-ray disc into the Blu-ray recorder drive. Launch Leawo Blu-ray Coy, click the inverted drop-down arrow next to the “Add Blu-ray/DVD” button and then click the “Add iso file” option to open the ISO file you just generated from your original Blu-ray disc. After loading generated ISO file, set blank Blu-ray drive as target in “Copy to” box on the popup “Add iso file” window and then click the “Burn” option to burn generated ISO file to Blu-ray disc. To make it easy to understand, take a closer look at the below video demo to learn how to backup Blu-ray movies on PC.